While many couples want to avoid redneck wedding cake toppers at their nuptials, others embrace the lifestyle and want to incorporate aspects into their wedding day. What some people consider "redneck" is normal to others. Adding a redneck topper to your cake involves a certain amount of planning, as they are not always available in the bridal section of a wedding supply shop. The toppers used on redneck wedding cakes tend to vary depending on the couple's interests and hobbies. The key to making a topper redneck is to play upon common stereotypes or misconceptions, often exaggerating them. Most toppers range from $30 to around $90, depending on the design. Custom pieces usually require contacting the company or artist directly for a quote. Most toppers are sized to fit on a standard six or eight inch cake unless otherwise noted. Deer Hunting Couple (pictured above): If you're often decked out in your camo, pick up this topper that features a couple ready for the season to start, complete with rifles. This affordable topper is sold by That's My Topper. Bass Splash Fishing Cake Topper (pictured at right): Couples who love fishing are sure to swim towards this topper that features two bass nearly kissing. While actually salt and pepper shakers, the website claims they are would be good to use for topping a cake. The fact they are shakers and not true toppers just adds to their "redneck-ness". They're sold by Wedding Collectibles. Gone Hunting Cake Top: The small tuft of tulle tied onto the fir tree with criss-crossed rifles and a sign declaring the couple has "gone hunting" just makes this topper all the more redneck. Pick it up at Wedding Collectibles. Wedding Moose: Pick up a topper that features moose dressed as the bride and groom. It's available from Janye Williams Wedding Collections. If moose aren't quite your animal of choice, the online retailer also has animal toppers like deer, skunks, mice, and chickens. 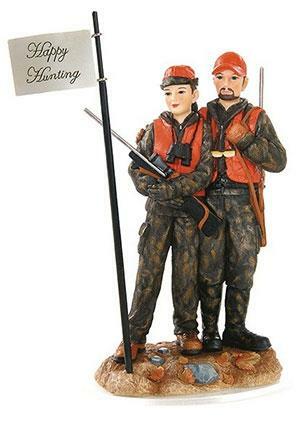 Hunting Groom Topper: For a hilarious redneck hunting-themed topper, check out the one sold by Your Cake Topper.com. It features the groom tied on the front of an ATV driven by a deer, with a triumphant bride and laughing deer. Hunting and animal-themed toppers would look great on cakes that are frosted in brown or green or on themed cakes in camouflage. 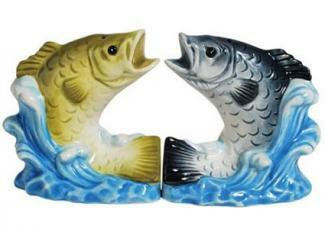 Fishing and fish toppers look lovely set atop blue or water themed cakes. Drinking Drinker Wedding Cake Topper: The groom is being hauled away by his wife for downing one too many Miller Lite beers in the topper sold by WedSet. Also included with the topper is a garter, topper box, and a "something blue" surprise. Drunk Bride and Groom (pictured at right): Magic Mud can custom make almost any topper for your cake, including one that looks like the bride and groom have indulged a bit too much in their bar during the reception festivities. Call their 1-800 number or email them to get a quote for your custom topper. 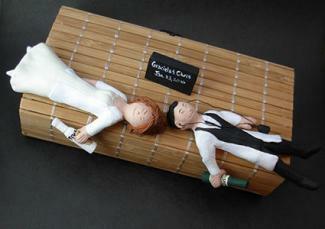 Custom Drunk Wedding Cake Topper: Find plenty of custom toppers on Etsy, including this drunk couple that are passed out on top of the cake. A topper featuring alcohol can top any style of cake - the disconnect between the redneck topper and an elegantly frosted cake is one that would fit with the idea of turning a normally sophisticated event like a wedding into a redneck event. Alternatively, consider decorating the cake with grape vines, kegs, and branded alcohol plaques. 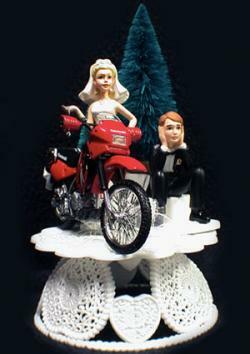 Motorcycle Wedding Cake Topper (pictured at right): The bride holds the keys to the groom's bike on this topper that has the couple looking less than festive. Pick it up from Your Cake Topper.com. ATV Cake Topper: This cake topper features a bride with her dress hitched up so she can ride on the back of her groom's ATV. Pick it up at Magical Day. Vehicles often work well on cakes that are decorated to suit the vehicle. Roadways, whether dirt or paved, are often worked into the cake design. Junk foods and drinks are classic redneck themes. It's easy to simply place your favorite foods on top of the cake itself. Unwrap a couple of snack cakes, make lattice designs out of licorice, or stack donuts in a small pyramid atop your cake for a special look. Keep in mind that the larger the food item, the bigger the cake will need to be in order to support the foods. M&M'S Topper Set: Find a cake topper set that features two M&M'S characters in front of a floral heart backdrop. While this set from Your Cake Topper.com is priced a little higher than most individual toppers, it includes a lot of extras like toasting glasses, cake knife and server set, guest book and pen, and a garter. 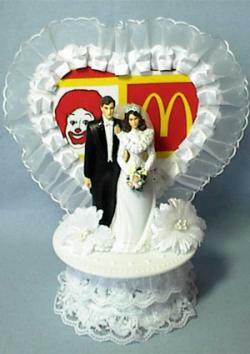 McDonald's Restaurant Topper: Share your love of fast food by picking out a topper that features a traditional bride and groom in front of a heart-shaped backdrop with McDonald's images. This one is found at Fun Wedding Things. Toppers usually look best on a tiered wedding cake, lest they be mistaken for a birthday cake. Adding the topper to a groom's cake or a funny rehearsal dinner cake is a great choice - that way you can have your redneck fun but an elegant cake as well. In addition to traditional cake or wedding supply stores, look for specific toppers at online marketplaces. There, you can often find unique toppers to fit your particular redneck needs. For example, you can find NASCAR toppers on eBay that may not be available elsewhere. Execution of the topper plays a pivotal role in making a topper redneck. For example, a porcelain bride and groom riding a crystal motorcycle is elegant for a themed wedding and not redneck in the slightest. However, put the bride in a short leather skirt, the groom in chaps, and cigarettes in their hands, and you have a redneck topper. Although some people want to avoid being labeled a redneck at all costs, others find the term charming and funny. If you are planning a redneck wedding, remember to add a topper to your cake as the finishing touch to your themed wedding.